Road Trip Day 1 got off to an auspicious start. We were aiming to hit the road between 8 and 9am and drive down to a friend’s house in south Jersey for the night with a pit stop at Jay and Silent Bob’s Secret Stash. 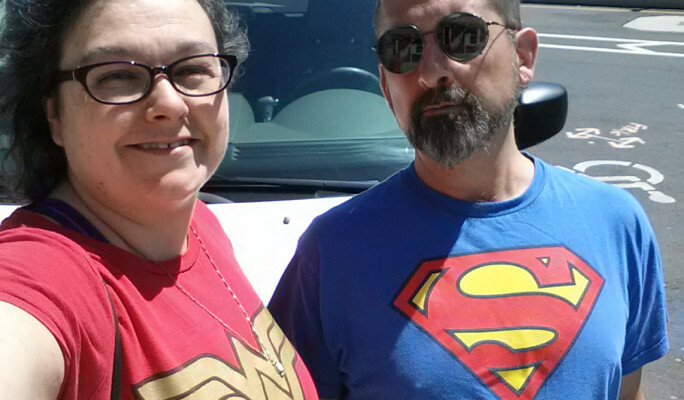 Not only did we get on the road at 7:55am (a full 5 minutes early), but my husband and I both decided independently to wear our superhero T-shirts. This was the first drive of any real length in our new van and also the first test of my mobile office plan. Since I build websites for a living and have too much work to really leave, the goal was to clock as many hours as I could working while my wonderful husband drove. I would say the day was a success all around! Our new van drove smoothly and kept us cool without the slightest hint of overheating (a problem in our other older cars). I was able to get a lot of work done from the back seat. Basically by using a hot spot to connect to the Internet, a power inverter to keep my laptop and the hot spot charged, and a really cool flexible desk I was able to work almost the entire trip. We had enough time to detour to the comic book store owned by Kevin Smith which, as fans, was someplace we always wanted to visit. It was super cool to see the actual Quick Stop sign, as well the Buddy Christ, and Silent Bob’s jacket and baseball cap (see photos below). After our geek pilgrimage, we headed further south to our friends Doug and Betzy’s house. Lela and Dot were also there and we had a lovely time hanging out and relaxing. Betzy made wonderful taco fixings and we stuffed ourselves before playing some games and finally heading to bed. The Tappan Zee bridge looks like it’s possibly under attack from At Ats! They still have coin catches at the New Jersey toll booths (note this excitement wore off after we realized how many tolls there were). John’s new hair cut has kept him from being compared to Jesus for some time, but they’re still close.